A Seminar on “Forest Biomass Utilization: Linking R&D with Stakeholders and Entrepreneurs” was organized by the Chemistry Division of Forest Research Institute (FRI), Dehradun on 14th March, 2018 in the Board Room of FRI. 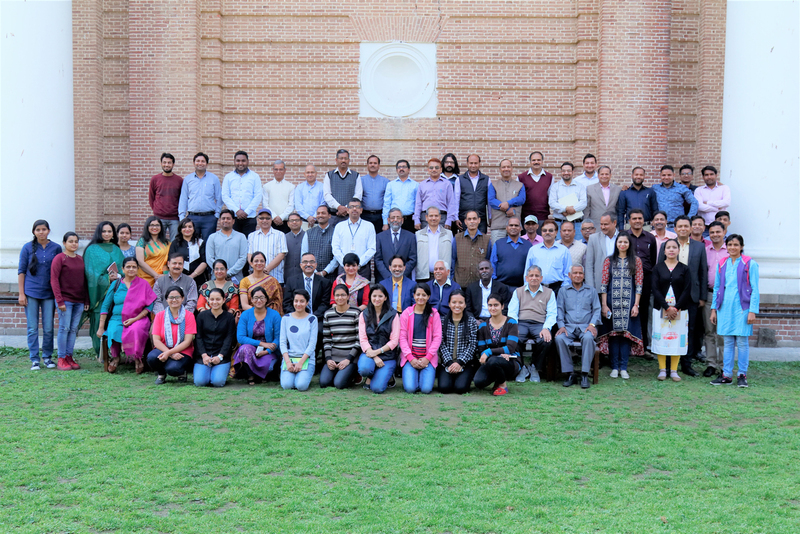 Eminent scientists and academicians from leading institutions including IIT, IIP, THDC, SFD, CAP; veteran scientists of FRI and representatives from State Forest Department, NGOs and industries participated in the Seminar. Inaugurating the Seminar, Dr. Savita, Director, FRI and Chief Guest of the event underlined the importance of biomass utilization in the era of bioeconomy. She highlighted that this seminar is in tune with the initiatives of ICFRE aiming to identify the gaps and develop field usable approaches / strategies for taking research from laboratory to land as far as possible to the grass root level.In his key-note speech, Prof. I.P. Singh from NIPER, Mohali described the therapeutic significance of plant derived chemicals and products giving special focus on the bioactivity of the compounds isolated from Moringa oleifera (sahjan) and Alpinia galanga in treatment of leishmaniasis disease caused by mosquitoes. Before this Dr. Vineet Kumar, Head, Chemistry Divison, FRI welcomed the delegates and all the participants and Dr. V.K. Varshney briefed about the seminar. The inaugural session was ended with vote of thanks proposed by Dr. Y.C. Tripathi.There were four lectures in the first technical session. The Head, Chemistry Division presented the highlights of the research accomplishments of the Division. Dr. P.L. Soni, ex Head, Chemistry Division, FRI elaborated the relevance of value addition of biomass for safeguarding the forests by citing his research on ‘Jigat’, the binder of incense sticks, and katha from Uncaria gambier. He also presented the success stories of the value addition of cellulose and seed gums for industrially usable products. Shri Jagdish Chander, CCF, Harayana State Forest Department talked about enormous perspectives of various plant species of forest origin with regard to chemical intervention to capitalize on their true economic potential. Dr. Debashish Ghosh from IIP, Dehradun highlighted the status and perspective of the research on utilization of biomass for biofuel production. The session was chaired by Prof. I.P. Singh.Second technical chaired by Dr. P.L. Soni was comprised of three lectures. Dr. Nirpendra Chauhan, from CAP, Selaqui, Dehradun exemplified the role of cultivation and processing of aromatic plants in livelihood generation, rehabilitation of the abundant land and checking migration of inhabitants from the hills. Dr. Rameshwar Dayal, ex-Head, Chemistry Division, FRI detailed about his research on isolation and characterization of bioactive compounds from a large number of medicinal plants of forest origin and development of natural dyes from forest biomass. Dr. Chinnappan Baskar from THDC Institute of Hydropower Engineering and Technology, Tehri Garhwal, spoke about the biorefinery approach for biomass conversion into fuels and speciality chemicals.A separate session for panel discussion chaired by Dr. Rameshwar Dayal was held in which representatives form academia, SFDs, NGOs and industry shared their views and thoughts and extended suggestions. Shri Gaurav, a start up aroma entrepreneur expressed his concern over sustained supply of aromatic raw materials and stressed the linkages of growers and industry with the R&D institutions. Shri T.S. Bisht, an NGO emphasized the need to ensure the follow up actions by the R&D institutions of their lab to land activity, awareness and capacity building of the farmers and tree growers, nutritional evaluation of wild fruits and scientific validation of their traditional nutritional claims, and sustained outreach of implementable research outcomes to the beneficiaries in local / regional languages. Dr. Arun Kumar, Head, Chemistry Department, Doon University pointed out the need of diversification of the bioactive plant chemicals for their non medical applications. The delegates also emphasised the need of expertise based inter institutional as well as institutional-entrepreneurial collaborations for conduct of need based research and generation of the effective and usable outcome in the interest of different stakeholders and environment. The seminar was concluded with the vote of thanks proposed by Dr. Rashmi.